Charlene and I started the company Coffee and Magic. 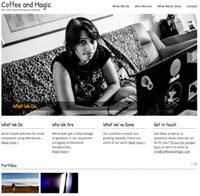 We Make Simple WordPress Websites – built using coffee and magic! We just completed and launched the website for our first client, the amazing explorer Daniel Fox. Go have a look at his incredible adventures at www.wildimageproject.com.